On June 20, Joyce Irwin, President & CEO of Community HealthNetwork, resigned from her post as EmployIndy’s Board Chair. Joyce has been on our board since 2013 and led her last board meeting today. She is an influential leader in our community and to say she has made a positive impact on our organization would be an understatement. Joyce has been a part of the EmployIndy family as she impacted leadership turnover, encouraged organization growth, and facilitated innovative change as we established our Five-Year Strategic Plan, launched in 2017. 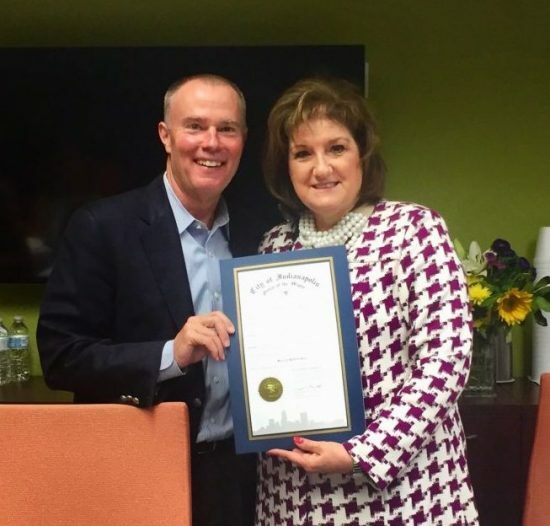 In her final board meeting, Mayor Joe Hogsett granted June 20 as Indianapolis’ “Joyce Irwin Day,” recognizing the influence she has had on Marion County’s workforce and throughout the Indianapolis community. Thank you, Joyce, for your support and we wish you the best on all your future endeavors!